Thank you for your cooperation in providing the requested information. The following book(s) will continue to be available in the Kindle Store. If you have any questions regarding the review process, you can write to us at kdp-quality@amazon.com. While it was unnerving to have to go through the process of proving that I did, indeed, author this book, I am nevertheless relieved to get this email. The fact that they got back to me in only four days is quite impressive. Now I will be prepared if this ever comes up again in the future. Last Sunday was the book launch for The Chosen Ones: The Team That Beat LeBron. 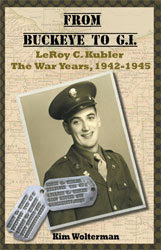 The author of this book is my cousin Tony Meale. He decided to hold a book launch for his family and friends as well as some of the players from Roger Bacon High School who were on the state championship team in the 2001-2002 school year. The event was held in the cafeteria of Roger Bacon High School, which was fun because it added to the ambiance of the day. A television played a video of the final game of the state championship, and there were always people gathered around it watching the plays. It was also fun to see the trophy, mounted newspaper article announcing the winning team, and the plaque highlighting the team members. Tony was expecting around 150 people to show up for the launch, and I think he had every bit of that, with people coming and going from 1:00-5:00. I was not surprised by the number of folks that came out for the book signing, because Tony has a lot of friends and family. What did amaze me was that three television stations and at least one newspaper came as well! I have never seen that at a book launch. You might be tempted to say that Tony was lucky because it was a slow news day so the press had nothing major to cover. Or that the press only came because it was a Sunday afternoon and there was free food. But you would be missing an important lesson here. Tony carefully timed his book launch to coincide with the NBA finals. There is a media frenzy going on right now with the finals and specifically LeBron James. The press is hungry for anything and everything LeBron. And The Chosen Ones offers up something new to talk about regarding LeBron. Of course Tony could not have predicted that LeBron James and the Miami Heat would indeed appear in the finals this year when he decided to write a book highlighting the tenth anniversary of the 2002 state championship game in which Roger Bacon High School became the only Ohio team to beat LeBron James and his teammates from St. Vincent-St. Mary High School. But the finals do include the Heat, so Tony is able to capitalize on the media exposure. And what exposure there has been! 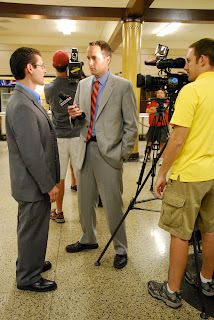 Tony has appeared on television, the radio and on Internet radio programs discussing his book and the Roger Bacon team. And those are only the things I know about. What I will say about Tony is that he makes it very easy for the press - he interviews well, he is personable and, most importantly, he is passionate about his topic. For my part I have posted YouTube videos of the film I shot at the book launch as well as of the photos I took at the event. Since YouTube is the second largest search engine in the world, I think the videos will help garner exposure for the book and Tony's website, www.thechosenonesthebook.com. The takeaway from all of this is to carefully plan the launch of your book. Most of us won't have LeBron James to hang our hats on, but there may be other media events or calendar events that you can work with. For example, a book on the history of ice cream could be launched on National Ice Cream Day. Here is a website where you can see usual and unusual calendar celebrations. There are other websites out there as well. The media will be looking for stories to cover for these special days. Make their job easier, and they will help you promote your book. Once the red haze cleared from my eyes over Amazon implying that I had either a) stolen another author's work and put my own name on it, or b) gathered up a bunch of free material on the Internet and placed it in a book to call my own, I turned to Google to see who else had been put in a similar situation. As it turns out I had plenty of company. In fact in the Kindle Direct Publishing forum there was quite a lively discussion that had taken place. I had to sort out the responders who were throwing around comments about KDP Select (another program entirely where you do agree to have your book listed ONLY with Amazon for a set period of time) but I finally found a couple of authors who explained what they had successfully done to satisfy Amazon that they were, indeed, the authors of the books in question. Please let me know if you have any further concerns about this title. Author of Who's Been Sleeping in My Bed(room)? From what I have read it can take one to two weeks to receive a reply back from Amazon. In the meantime you just pray that they don't take your book down until they make their decision. Amazon will have you believe that they are doing this to protect the rights of authors, and to make sure that people aren't just scraping up wiki material on the web and turning it into a book for profit. The Amazon conspiracy theorists believe that this is another attempt by Amazon to try to get authors to only lists their books for sale on Amazon. I suspect there is some truth in both opinions. Another lesson learned in this new world of publishing. Stay tuned for how I make out with the Goliath. My cousin Tony Meale began writing a non-fiction book last summer. Over the past ten months or so we have talked, emailed and facebooked about the writing process, setting up a publishing company, layout and design, printing and distribution of books. Now all of his work has paid off and his book launch is on Sunday. I feel like a proud momma! I wasn't sure it was going to work out, but the stars have aligned and I will be driving over to Cincinnati early Sunday morning to take part in the festivities. What is amazing to me is that he has already had two radio interviews, one television interview that will air on the night time news in Cincinnati (one half tonight and one half tomorrow night, no less!) and a news station in Florida has interviewed one of the basketball players who appears on the cover of Tony's book. The video of the interview is online along with a mention of where you can buy the book. 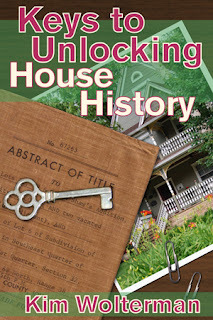 Why all the interest in a book written by a 27 year-old first time author? 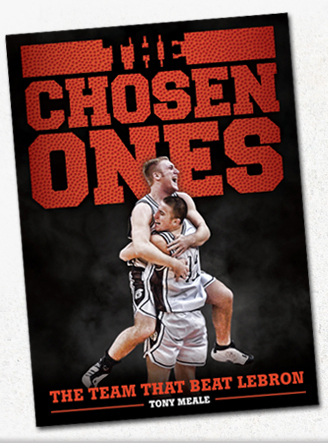 You see, Tony's book is called The Chosen Ones with the subtitle The Team That Beat LeBron. It is about the only Ohio high school team to ever beat LeBron James, and at the state championships no less. It has been ten years since the upset, but people in Ohio still remember the game. The fact that the book releases on Sunday, the day after the last game of the Eastern Conference finals in which LeBron will play a key role, is no coincidence. Tony has planned his marketing campaign well.